Abstract: The research is formed for increasing the ability of question on student and the activity of indonesia language on both student and teacher by using the applicationcooperative of Team Game Tournament (TGT) type. This research category is the classaction research. This research has been done in two cycles. The first cycle contains oftwo meetings which involve 29 fourth grade students of SDN Kebonharjo I as thesubject in this research. The datas of this research is got by direct observation. Thisobservation datum which is used for observing the activity of both student and teacherand observing the ability of question on student as long as the subject matter is occurredthat is analyzed by scoring is provided by the presentation. The result of this researchshows that by using cooperatif ofTeam Game Tournament (TGT) type, the activity ofboth the student and teacher, the ability of question on student in science has increased.The percentage of student activity on the first cycle shows 51,91% and the percentageof the second one shows 60,72%. Then, the percentage of teacher activity on the firstcycle shows 48,75% and the percentage of the second one shows 81,87%. The last one,the percentage of the student ability of question also shows the increase, on the firstcycle shows 54,66% and for the second one shows 78%. By this research, it is wishedcan make the teacher more creative and innovative in using the type of subject tomotivate the student to be better in getting the best result. Based on this research result,the teacher of elementary school is suggested for using cooperative of Team GameTournament (TGT) type for increasing the student ability of question on indonesialanguage. PUJIASTUTI, Arik Umi. PENERAPAN KOOPERATIF TEAM GAME TOURNAMENT (TGT) UNTUK MENINGKATKAN KEMAMPUAN BERTANYA PADA PEMBELAJARAN BAHASA INDONESIA BAGI SISWA KELAS IV SDN KEBONHARJO I. JURNAL PENDIDIKAN DASAR NUSANTARA, [S.l. ], v. 1, n. 2, jan. 2016. ISSN 2579-6461. 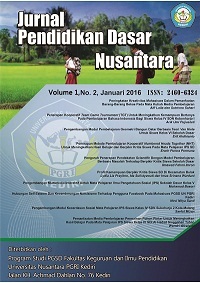 Available at: <http://ojs.unpkediri.ac.id/index.php/pgsd/article/view/214>. Date accessed: 25 apr. 2019.